Sharing the blame: "I cannot believe that my superiors did not realize the amount I was risking. It is impossible to generate such profit with small positions. That's what leads me to say that while I was positive [in the black], my supervisors closed their eyes on the methods I was using and the volumes I was trading. A trader can't generate so much cash on a daily basis with standard activities." In 2005, Jérôme Kerviel got the biggest break of his career: a promotion out of Société Générale SA's lowly back office -- a place so uncool it was dubbed "the mine" -- and into a coveted job as a trader at the powerful bank. But if clawing your way up from the mailroom wins you a badge of honor in the U.S., not so within in the rigid class system that defines the upper ranks of French finance. Mr. Kerviel's effort to impress his colleagues now appears to be a motivating factor behind his disastrous trading spree, which burned a €4.9 billion ($7.3 billion) hole in Société Générale's books. "I was held in lower regard than the others because of my educational and professional background." Mr. Kerviel told prosecutors over the weekend. His comments were from a transcript and confirmed by prosecutors and his lawyer. Trading might not be rocket science, but Société Générale has a tradition of drawing its star traders from France's most elite schools. Many have doctorates in disciplines such as astrophysics or nuclear science. They are known as "quants" for the complex "quantitative" mathematical trading formulas they develop. They pull down the biggest paychecks. The bank's top brass, including investment-banking head Jean-Pierre Mustier, is from the engineering school Polytechnique, the M.I.T. of France. Chief Executive Daniel Bouton graduated from the prestigious Ecole Nationale d'Administration, a school known for churning out high-level government functionaries that run the country. "If you graduated from ENA or Polytechnique, you have an absolute tenure; if not, you miss out on all the good job opportunities," according to a former Société Générale executive. "This rift exists all over the bank." French authorities placed Mr. Kerviel under formal investigation Monday on charges of forgery, breach of trust and breaking into computer systems. He was released but barred from leaving the country. Société Générale has accused him of fraudulent trading that at one point left the bank exposed by €50 billion. "His career path made him sort of an exception," says Mr. Mustier. It hasn't always been this way. Société Générale's current corporate culture is a byproduct of the bank's transformation in the late 1980s from a conventional retail bank to a major player on the global financial stage, according to Michel Marchet, a representative of one of the bank's labor unions and 40-year employee. When he started, Mr. Marchet recalls, even employees without college degrees could build successful careers. Suddenly, they found themselves overshadowed by new recruits plucked from France's top-notch schools. The rise of a new "elite" class, Mr. Marchet says, also meant "fewer working-class people were joining the bank." The high-pressure atmosphere has taken its share of victims. In June, a trader in his 30s who worked on the same floor as Mr. Kerviel jumped to his death from a footbridge near Société Générale's towering headquarters in the La Défense suburb of Paris. Moments before his death, Mr. Marchet says, a supervisor had interrogated the trader for losing about €9 million in unauthorized trades. "He took his bag, left Société Générale and jumped off a bridge," Mr. Marchet says. A spokeswoman at Société Générale declined to comment on social tensions at the bank. She confirmed that an employee committed suicide last year. That death came in the wake of two other suicides in recent years. In 2005, a trader jumped to his death from a ninth-floor window at the bank's headquarters, Mr. Marchet said. A year later, a back-office employee jumped in front of a train commuting between La Défense and the center of Paris. The trading desk where Mr. Kerviel landed, the "Delta One" unit, deals with trades aimed at making small profits with stock-market fluctuations. Mr. Kerviel, who hails from a small town in Brittany and graduated from a little-known university, suggested in his statement to prosecutors that he hoped to curry favor with people who counted. Mr. Kerviel's job was to invest by simultaneously taking opposite bets on the direction of the markets. The bets were supposed to mostly offset each other in what is typically a low-risk way to make a small profit. But starting in November 2005, Mr. Kerviel started placing bets only in one direction, hoping for far bigger gains. To hide his strategy, he created a set of parallel fake bets in the other direction to give his supervisors the illusion that his books were correctly balanced. When his supervisors asked him about unusual transactions, Mr. Kerviel would rely on simple tricks to evade their inquiries. "I fabricated a fake mail using a feature in our in-house messaging system, a function which allows you to reuse the electronic letterhead I had received and change the body of the text," he said. At first, Mr. Kerviel's strategy paid off -- too well, in fact. His gains snowballed so quickly that, at some point, he had locked in a gain of €1.6 billion, about a third of the bank's overall net profit in 2006. At that moment, "I don't know what to do," Mr. Kerviel told investigators. "I am happy, proud, but I don't know how to justify my gains." What seemed to disappoint Mr. Kerviel was that his trading prowess wasn't being acknowledged. He told prosecutors that he believes managers were aware of his methods but never spoke up as long as things were going well. "I cannot believe that my superiors did not realize the amount I was risking," he said in the interrogation. "It is impossible to generate such profit with small positions. That's what leads me to say that while I was [in the black], my supervisors closed their eyes on the methods I was using and the volumes I was trading. The initial reports are confirmed; Kerviel used hacking to hide his trades: stolen passwords, fake accounts, deep knowledge of the risk management systems. The Times correctly reports (unlike, e.g., the network news this weekend) that although SocGen's losses in closing out the positions totaled around $7 billion, the size of the actual positions was an order of magnitude larger. Below is some background on Societe Generale, the second largest bank in France, originally established by Napoleon. Their equity derivatives business accounts for 20 percent of total profits and employs 3,500 people. (As I mentioned in a previous post, none of the U Oregon honors college students I polled knew what a derivatives trader was. France on the other hand is traditionally strong in mathematics and finance.) Legendary figure Jean-Pierre Mustier helped pioneer the derivatives business in Europe. NYTimes: Mr. Mustier, a native of Clermont-Ferrand in the Auvergne region of France, has become the bank’s point man on the scandal, shepherding reporters through the details of Mr. Kerviel’s trades while frequently conferring with his boss, Daniel Bouton, the bank’s chief executive. I highly recommend this essay in the Financial Times. It notes that current banking and money management compensation schemes create incentives for taking on tail risk (which is really beta) and disguising it as alpha. The proposed solution: holdbacks or clawbacks of bonus money. This would probably be a big improvement over the status quo (although how long would one have to wait to be sure that risk was properly priced on a group of thirty year loans?). When will shareholders smarten up and enforce this kind of compensation scheme on management at public firms? Clawbacks already happen in VC when early success turns into losses for a fund. A minor quibble with what is written about VCs: in many cases "activism" is too strong a characterization -- it is the inventor/entrepreneur who does all the work. Summary: Raghuram Rajan says bogus alpha is created by hiding long-tail risks, as with structured products linked to subprime mortgages. A solution would be to hold in escrow a big chunk of bonuses until the full risks play out, meaning only true alpha gets jumbo rewards and reducing the hidden risks in the financial system. Banks have recently been acknowledging enormous losses, yet those losses are barely reflected in employee compensation. For example, Morgan Stanley announced a $9.4bn charge-off in the fourth quarter and at the same time increased its bonus pool by 18 per cent. The justification was that many employees had a banner year and their compensation should not be held hostage to mistakes that were made in the subprime market. The chief executive, John Mack, however, assumed some responsibility and agreed to take no bonus for 2007 – although he got a $40m payout for 2006. Even so, most readers would suspect something is not right here. Indeed, compensation practices in the financial sector are deeply flawed and probably contributed to the ongoing crisis. The typical manager of financial assets generates returns based on the systematic risk he takes – the so-called beta risk – and the value his abilities contribute to the investment process – his so-called alpha. Shareholders in asset management firms, such as commercial banks, investment banks and private equity or insurance companies are unlikely to pay the manager much for returns from beta risk. For example, if the shareholder wants exposure to large traded US stocks she can get the returns associated with that risk simply by investing in the Vanguard S&P 500 index fund, for which she pays a fraction of a per cent in fees. What the shareholder will really pay for is if the manager beats the S&P 500 index regularly, that is, generates excess returns while not taking more risks. Hence they will pay for alpha. In reality, there are only a few sources of alpha for investment managers. 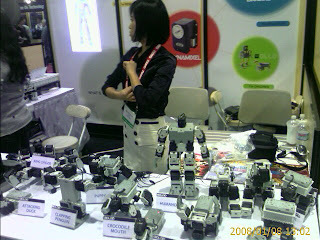 One of them comes from having truly special abilities in identifying undervalued financial assets. Warren Buffett, the US billionaire investor, certainly has it, yet this special ability is, by definition, rare. A second source of alpha is from what one might call activism. This means using financial resources to create, or obtain control over, real assets and to use that control to change the payout obtained on the financial investment. A venture capitalist who transforms an inventor, a garage and an idea into a fully fledged, profitable and professionally managed corporation creates alpha. A third source of alpha is financial entrepreneurship or engineering – creating securities or cash flow streams that appeal to particular investors or tastes. As long as the investment manager does not create securities that exploit investor weaknesses or ignorance (and there is unfortunately too much of that), this sort of alpha is also beneficial, but it requires constant innovation. Alpha is quite hard to generate since most ways of doing so depend on the investment manager possessing unique abilities – to pick stocks, identify weaknesses in management and remedy them, or undertake financial innovation. Such abilities are rare. How then can untalented investment managers justify their pay? Unfortunately, all too often it is by creating fake alpha – appearing to create excess returns but in fact taking on hidden tail risks, which produce a steady positive return most of the time as compensation for a rare, very negative, return. For example, an investment manager who bought AAA-rated tranches of collateralised debt obligations (CDO) in the past generated a return of 50 to 60 basis points higher than a similar AAA-rated corporate bond. That “excess” return was in fact compens ation for the “tail” risk that the CDO would default, a risk that was no doubt perceived as small when the housing market was rollicking along, but which was not zero. If all the manager had disclosed was the high rating of his investment portfolio he would have looked like a genius, making money without additional risk, even more so if he multiplied his “excess” return by leverage. Similarly, the management of Northern Rock followed the old strategy of taking on tail risk, borrowing short and lending long and praying that the unlikely event of a liquidity shortage never materialised. All these strategies essentially earn the manager a premium in normal times for taking on beta risk that materialises only infrequently. These premiums are not alpha, since they are wiped out when the risk materialises. True alpha can be measured only in the long run and with the benefit of hindsight – in the same way as the acumen of someone writing earthquake insurance can be measured only over a period long enough for earthquakes to have occurred. Compensation structures that reward managers annually for profits, but do not claw these rewards back when losses materialise, encourage the creation of fake alpha. Significant portions of compensation should be held in escrow to be paid only long after the activities that generated that compensation occur. The managers who blew a big hole in Morgan Stanley’s balance sheet probably earned enormous bonuses in the past – Mr Mack certainly did. If Morgan Stanley managed its compensation correctly those bonuses should be clawed back and should be enough to pay those who did well this year without increasing the bonus pool. At the very least, shareholders deserve better explanations. More generally, unless we fix incentives in the financial system we will get more risk than we bargain for. Unless bankers offer these better explanations, their enormous pay, which has been thought of as just reward for performance, will deservedly come under scrutiny. Societe Generale's L'Affaire Kerviel is unbelievable, and I suspect we'll be learning some interesting details in the coming days. A unique aspect of his case is that he started in the back office before making it to the trading desk, and used his knowledge of SocGen's systems to mask his positions. But why did he do it? If his trades had been successful I don't see how he could have profited personally. As a junior trader he couldn't walk up to his boss and say "See, I made you 4 billion Euros, where is my bonus?" -- he would have been fired right away for taking the positions in the first place. And, despite his back office acumen I don't see how he could have gotten the profits out of the bank without anyone knowing. It almost seems as if his goal from the beginning was to bring down the bank. PARIS — On the elite trading floors here, where France’s brightest minds devise some of the most complex instruments in global finance, few people noticed Jérôme Kerviel. He was lucky to be there at all. Many of his colleagues had been plucked from the prestigious Grandes Ecoles — the Harvards and M.I.T.’s of France — and wielded advanced degrees in math or engineering. Mr. Kerviel arrived from business school and started out shuffling paper in the back office. But on Thursday the world came to know Mr. Kerviel, 31, as the most dangerous accused rogue trader ever, a young gambler who found himself sucked into a spiral of losses that left a $7.2 billion hole in Société Générale, one of France’s largest and most respected banks. While Société Générale executives maintained that he had acted alone, many questioned how that was possible given the scope of the losses. “There are plenty of excellent brains at Société Générale, consequently I find it hard to believe the risk management systems and all the auditors did not indicate anything at any level,” said Hélyette Geman, a professor of mathematical finance at ESSEC, a leading French business school, as well as professor at the University of London. It is a remarkable turn of events for Société Générale, which since the mid-1980s has built itself into a global powerhouse in trading derivatives like futures and options. “In France we considered Société Générale a magic bank,” Ms. Geman said. But Mr. Kerviel, described by bank executives as a shy junior trader, did not fit the mold at Société Générale. The bank lures its top talent from the country’s premier science and engineering schools in Paris. Mr. Kerviel grew up in Brittany, in western France, and attended the University of Lyon. He joined Société Générale in 2000 as what was effectively a clerk, processing and recording the trades made on the trading floor. By 2006, Mr. Kerviel had worked his way up to the trading floor, where he specialized in arbitrage, or making bets on small difference between various European stock market indexes such as the CAC in France and DAX in Germany. All the same, covering the billions in market positions would have taken considerable skill. “Hiding it was a full-time job because you needed to know exactly what do,” this banker said. The chief executive of Société Générale’s corporate and investment banking unit, Jean-Pierre Mustier, insisted that the bank’s own investigation showed what they termed the rogue trader to have acted without the knowledge or cooperation of his superiors. Mr. Kerviel’s bad bets in the markets came to light a week ago. According to bankers familiar with the situation who asked for anonymity because the investigation was continuing, risk control specialists at the bank first discovered the suspicious trades on Friday. After combing through trading records all day Saturday, the executives discovered the extent of the fraud. Mr. Mustier returned to Paris from London to oversee the investigation at Société Générale’s headquarters over the weekend. Mr. Kerviel was summoned and was questioned there Saturday night. Among financial veterans of other trading floors as well as financial experts across Europe on Thursday, there was widespread incredulity that a junior employee like Mr. Kerviel could have racked up such huge losses without the knowledge of his superiors. Like Nick Leeson, the trader who brought down Barings bank by making huge secret bets on Asian markets in 1995, Mr. Kerviel was something of an anomaly on Société Générale’s trading floor. According to officials at the bank, Mr. Kerviel’s losses came from bets made on what they termed “plain vanilla products,” relatively simple futures tied to major European stock indexes. He had made bullish bets, a senior banker said, which were gradually unwound over the first three trading days of this week. The banker insisted that the closing of those positions had not contributed to the huge losses on European bourses Monday and Tuesday. Adding to the mystery is the conclusion by Société Générale executives that Mr. Kerviel had not profited from his trades. The Journal has a bit more; looks like a bit of hacking + rogue trading. A new combination? WSJ: ...Société Générale's computer systems are considered some of the most complex in banking for handling equity derivatives, that is, investment contracts whose value moves with the value of other assets. Officials of the bank believe Mr. Kerviel spent many hours of hacking to eliminate controls that would have blocked his super-sized bets. Changes he is said to have made enabled him to eliminate credit and trade-size controls, so the bank's risk managers couldn't see his giant trades on the direction of indexes. Mr. Citerne said the bank didn't notice the unauthorized trading until last week because the trader had "intimate and malicious" knowledge of its procedures and knew at what dates checks were conducted. "Each time he took a position one way, he would enter a fictitious trade in the opposite direction to mask the real one," Mr. Citerne said. According to one person familiar with the situation, Mr. Kerviel used the computer log-in and passwords of colleagues both in the trading unit and the technology section. According to one person familiar with events, the bank's controls did red-flag an outside trading partner of the bank, whose account showed unusually high finance levels. The client, when asked by the bank about the account's finances, denied knowing of it. Pursuing this matter ultimately led to Mr. Kerviel. Executives called him in for questioning on Saturday, said Mr. Bouton. The interrogation took a good part of the day because Mr. Kerviel had convinced himself that he had mastered a new way to trade stock-index futures, according to a person familiar with the situation. For a while, he went in circles while justifying the trading strategy, this person said, but finally on Saturday night he broke down and admitted the trades. Wikipedia has an entry on largest trading losses. I don't really think of John Meriwether of LTCM (or even, I guess, Brian Hunter) as a rogue trader, although I suppose their investors didn't know exactly what they were up to. "No scientific basis for race"
The figure is from the following paper, reporting on a study of over 4000 individuals. The researchers can group most Europeans into a geographical cline (NW vs SE, that's the red band in the lower right of the figure; there are two clusters but also individuals who are in-between) + Ashkenazim (the pink isolated cluster in the upper left) using a few hundred markers. I'm sure even better resolution can be obtained with more loci. Abstract: European Americans are often treated as a homogeneous group, but in fact form a structured population due to historical immigration of diverse source populations. Discerning the ancestry of European Americans genotyped in association studies is important in order to prevent false-positive or false-negative associations due to population stratification and to identify genetic variants whose contribution to disease risk differs across European ancestries. Here, we investigate empirical patterns of population structure in European Americans, analyzing 4,198 samples from four genome-wide association studies to show that components roughly corresponding to northwest European, southeast European, and Ashkenazi Jewish ancestry are the main sources of European American population structure. Building on this insight, we constructed a panel of 300 validated markers that are highly informative for distinguishing these ancestries. We demonstrate that this panel of markers can be used to correct for stratification in association studies that do not generate dense genotype data. The money paragraph: "...Here we mine much larger datasets (more markers and more samples) to identify a panel of 300 highly ancestry-informative markers which accurately distinguish not just northwest and southeast European, but also Ashkenazi Jewish ancestry. This panel of markers is likely to be useful in targeted disease studies involving European Americans." For previous discussion of genetic clustering of human populations, see here and here. It has been known for some time that major continental groups ("races") form distinct clusters. Improved data allow for much finer exploration of clusters within clusters. ...no matter what genetic markers you choose: SNPs, STRs, no matter how you choose them: randomly or based on their "informativeness", it is relatively easy to classify DNA into the correct continental origin. Depending on the marker types (e.g., indel vs. microsatellite), and their informativeness (roughly the distribution differences between populations), one may require more or less markers to achieve a high degree of accuracy. But, the conclusion is the same: after a certain number of markers, you always succeed in classifying individuals according to continental origin. One thing commenters seem particularly confused about is the difference between phenotypic and genetic variation. 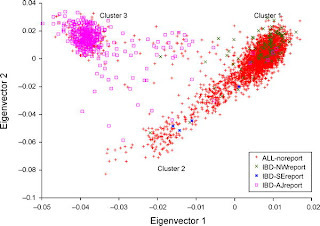 The clustering data show very clearly that, in certain subspaces, the genetic variation within a particular population cluster is less than between clusters. That is, the genetic "distance" between two individuals within a cluster is typically much less than the distance between clusters. (Technical comment: this depends on the number of loci or markers used. As the number gets large the distance between clusters becomes much larger than the individual cluster radius. For continental clusters, if hundreds or thousands of markers are used the intercluster distance dominates the intracluster size. Further technical comment: you may have read the misleading statistic, spread by the intellectually dishonest Lewontin, that 85% percent of all human genetic variation occurs within groups and only 15% between groups. The statistic is true, but what is often falsely claimed is that this breakup of variances (larger within group than between group) prevents any meaningful genetic classification of populations. This false conclusion neglects the correlations in the genetic data that are revealed in a cluster analysis. See here for a simple example which shows that there can be dramatic group differences in phenotypes even if every version of every gene is found in two groups -- as long as the frequency or probability distributions are distinct. Sadly, understanding this point requires just enough mathematical ability that it has eluded all but a small number of experts.) Update: see here for an explanation in pictures of Lewontin's fallacy. I also edited the paragraph above for clarity. On the other hand, for most phenotypes (examples: height or IQ, which are both fairly heritable, except in cases of extreme environmental deprivation), there is significant overlap between different population distributions. That is, Swedes might be taller than Vietnamese on average, but the range of heights within each group is larger than the difference in the averages. Nevertheless, at the tails of the distribution one would find very large discrepancies: for example the percentage of the Swedish population that is over 2 meters tall (6"7) might be 5 or 10 times as large as the percentage of the Vietnamese population. If two groups differed by, say, 10 points in average IQ (2/3 of a standard deviation), the respective distributions would overlap quite a bit (more in-group than between-group variation), but the fraction of people with IQ above some threshold (e.g., >140) would be radically different. It has been claimed that 20% of all Americans with IQ > 140 are Jewish, even though Jews comprise only 3% of the total population. ...The imbalance continues to increase for still higher IQ’s. New York City’s public-school system used to administer a pencil-and-paper IQ test to its entire school population. In 1954, a psychologist used those test results to identify all 28 children in the New York public-school system with measured IQ’s of 170 or higher. Of those 28, 24 were Jews. There is no strong evidence for specific gene variants (alleles) that lead to group differences (differences between clusters) in behavior or intelligence, but progress on the genomic side of this question will be rapid in coming years, as the price to sequence a genome is dropping at an exponential rate. What seems to be true (from preliminary studies) is that the gene variants that were under strong selection (reached fixation) over the last 10k years are different in different clusters. That is, the way that modern people in each cluster differ, due to natural selection, from their own ancestors 10k years ago is not the same in each cluster -- we have been, at least at the genetic level, experiencing divergent evolution. In fact, recent research suggests that 7% or more of all our genes are mutant versions that replaced earlier variants through natural selection over the last tens of thousands of years. Michael Lewis (Bloomberg) has some interesting comments on Goldman Sachs' vastly superior performance during the subprime meltdown. In an earlier post we discussed the $4 billion they made by shorting the major CDO indices. (See here for another close reading of the WSJ story that uniquely sheds some partial light on what happened.) It really boils down, as I mentioned earlier, to the huge proprietary trading component at Goldman. They apparently don't hesitate to take positions against other business units at the firm. Jan. 17 (Bloomberg) -- In retrospect, the most intriguing subplot in the collapse of the subprime mortgage market has been not the size of the losses but their distribution. Wall Street firms have a talent for getting themselves into trouble together. They all were long Internet stocks when Internet stocks collapsed and they'll all be long North Korean credit-default swaps whenever North Korea gets hot and then crashes. What's odd about the subprime crash is Goldman Sachs Group Inc. A single firm took a position contrary to the rest of Wall Street. Giant Wall Street firms are designed for many things, but not, typically, to express highly idiosyncratic views in the market. But at the same time it's pretty clear that a lot of these so-called risk managers never really had the power to manage risk. They had to consider the feelings, for example, of the guys who ran subprime mortgages. Morgan Stanley conceded as much when it said recently it was considering changing things around so that the risk manager reported to the CFO, rather than the heads of individual businesses. And this second, higher intelligence was allowed to make a mockery of the labors of the first. I can't think of another example of a big Wall Street firm saying so clearly through its trading positions as Goldman Sachs did over the past year that it thinks the rest of its industry, including its own people, is a bunch of idiots. They have obviously designed their firm to take into account their idiocy -- without ever having to put too fine a point on it. From now on, the ordinary traders and salesmen at Goldman Sachs can beaver away knowing that their opinions and judgments about the markets in which they operate are basically irrelevant. The guys at the top of the firm are making the market calls, and if the guys at the top disagree with them, well, they'll just take the other side of their trades. But then, why do you need the traders? And what happens when the guys at the top of the firm are wrong? NYTimes: There may be only three human activities in which miraculous accomplishment is possible before adulthood: mathematics, music and chess. These are abstract, almost invented realms, closed systems bounded by rules of custom or principle. Here, the child learns, is how elements combine and transform; here are the laws that govern their interactions; and here are the possibilities that emerge as you play with signs, symbols, sounds or pieces. Nothing else need be known or understood — at least at first. A child’s gifts in such realms can seem otherworldly, the achievements effortlessly magical. But as Bobby Fischer’s death on Thursday might remind us, even abstract gifts can exact a terrible price. In 1956 Mr. Fischer, at 13, displayed powers that were not only prodigious but also uncanny. 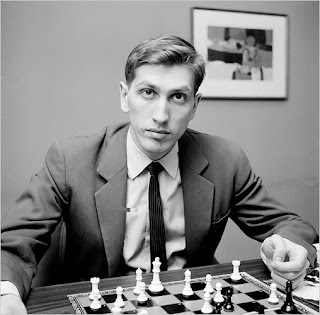 A game he played against Donald Byrne, one of the top 10 players in the United States, became known as “the Game of the Century,” so packed was it with brilliance and daring (and Mr. Fischer’s sacrifice of a queen). “I just got good,” he explained — as indeed he did, winning 8 of the 10 United States Championship tournaments held after 1958 and then, of course, in 1972, breaking the long hold that Soviet chess had on the international championship. “All I want to do, ever,” he said, “is play chess.” And many thought him the best player — ever. Garry Kasparov once said that he imagined Mr. Fischer as a kind of centaur, a human player mythologically combined with the very essence of chess itself. But of course accompanying Mr. Fischer’s triumphs were signs of something else. His aggressive declarations and grandiose pronouncements were once restricted to his chosen playing field. (“Chess is war over the board. The object is to crush the opponent’s mind.”) Eventually, they grew in scope, evolving into ever more sweeping convictions about the wider world. I was invited to address a class this morning in the Clark Honors College at U Oregon. The Honors College is like a small, select, liberal arts college within the university that requires special admission. It's one of the oldest honors colleges in the country and has (I'm told) a very good reputation. Most of its students could probably have been accepted at elite private colleges, but are getting a less expensive education here. At the end of the class I took a survey. I was particularly interested in the level of interest in science and science careers, and the level of awareness about the kinds of elite career paths that are common for Ivy League students. As I mentioned in an earlier post, about 50% of Harvard graduates now head into finance. It was my hypothesis (confirmed by the survey results) that even top students at public universities are generally unaware of these relatively new career options, as opposed to traditional high status jobs in fields like law, science and medicine. 25 participants, roughly equal numbers of seniors and juniors and a smaller number of sophomores. About 1/3 of the students were science majors. Some of the numbers below are estimates, as I had to quickly count the number of raised hands. Would you be unhappy if your annual salary never exceeds $100k per annum (in today's dollars)? only 3/25 said yes -- amazing! We all know who the losers are in the subprime meltdown: shareholders of Citi, Merrill, Countrywide Financial, etc. One of the winners is profiled below, a hedge fund manager who made $15B (keeping $3-4B himself!) from the bursting subprime housing bubble. On Wall Street, the losers in the collapse of the housing market are legion. The biggest winner looks to be John Paulson, a little-known hedge fund manager who smelled trouble two years ago. Funds he runs were up $15 billion in 2007 on a spectacularly successful bet against the housing market. Mr. Paulson has reaped an estimated $3 billion to $4 billion for himself -- believed to be the largest one-year payday in Wall Street history. On the way to his big score, Mr. Paulson did battle with a Wall Street firm he accused of trying to manipulate the market. He faced skepticism from other big investors. At the same time, fearing imitators, he used software that blocked fund investors from forwarding his emails. Like many legendary market killings, from Warren Buffett's takeovers of small companies in the '70s to Wilbur Ross's steelmaker consolidation earlier this decade, Mr. Paulson's sprang from defying conventional wisdom. In early 2006, the wisdom was that while loose lending standards might be of some concern, deep trouble in the housing and mortgage markets was unlikely. A lot of big Wall Street players were in this camp, as seen by the giant mortgage-market losses they're disclosing. Science filmmaker Alom Shaha sent me a link to his site labreporter.com, which features short films about real scientific experiments. There are a number about CERN and the LHC (Large Hadron Collider). The one below does a good job of conveying the immense complexity of modern particle physics research. New paper! You can find some additional discussion on Cosmic Variance. Abstract: Standard calculations suggest that the entropy of the universe is dominated by black holes, although they comprise only a tiny fraction of its total energy. We give a physical interpretation of this result. Statistical entropy is the logarithm of the number of microstates consistent with the observed macroscopic properties of a system, hence a measure of uncertainty about its precise state. The largest uncertainty in the present and future state of the universe is due to the (unknown) internal microstates of its black holes. We also discuss the qualitative gap between the entropies of black holes and ordinary matter. If you have any interest in virtual reality or computer games, I highly recommend this podcast of an interview with Ed Castronova, an economist who studies large-scale online games. He's the author of Exodus to the Virtual World: How Online Fun Is Changing Reality and Synthetic Worlds: The Business and Culture of Online Games. (There is a transcript of the interview at the first link above, as well as references and discussion; you can also listen to it as a stream if you don't have an ipod.) Castronova blogs here. I suspect Castronova would agree with me that if AI is eventually successful, then many, perhaps almost all, sentient beings in our future lightcone will be game characters who are themselves unaware that they live in a simulation. 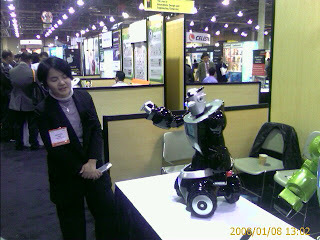 I had to visit this year's Consumer Electronics Show (CES) for some meetings. What a zoo! 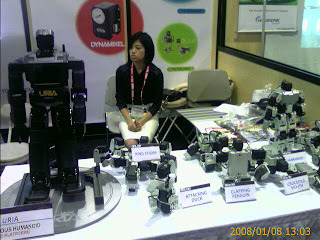 150k attendees descended on Las Vegas for this event. 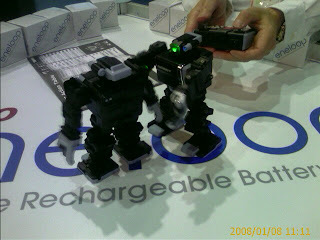 CES has two venues -- the Las Vegas Convention Center and the Sands Convention Center. The former hosts all the giants like Samsung, Microsoft, Sony, etc. 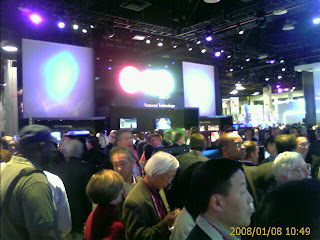 The top photo shows the LG "Life is Good" mega exhibit, complete with DJ, plush carpets and couches. As a consequence of having been a Junior Fellow, I get Harvard Magazine every other month. By comparison, I was a faculty member at Yale, and they don't send me anything. Perhaps that goes some way to explaining the disparity in endowments? I would certainly give money to Harvard before I would give it to Yale. Harvard Magazine is consistently the best alumni magazine I've seen (I fairly regularly look at the Berkeley, Caltech, Stanford and Yale counterparts; the last two are sent to people I know, not to me), although that doesn't mean that there isn't an occasional snoozer of an issue. This month there is a review of James Watson's book (no mention of his little faux pas in London, or of the interesting conversation with Derek Bok with which he ends the book -- but see below :-), an article about autism, and one on the new category of "alpha girls" in American society (Girl Power: what has changed for women and what hasn't). Here are the final paragraphs from Watson's book, excerpted by 02138, the other Harvard magazine. Before leaving Bok’s temporary office in Loeb House, mindful of the Summers fiasco, I remarked to Derek that the time was not far off when academia would have no choice but to hand political correctness back to the politicians. Since 1978, when a pail of water had been dumped over E. O. Wilson for saying that genes influence the behavior of humans as well as of other animals, the assault against behavioral science by wishful thinking has remained vigorous. But as science is able to prove its hypotheses ever more indisputably, such irrationality must recede or betray itself as such. In showing that human genes do matter, behavioral biologists will no longer be limited to comparisons of fraternal and identical twins. Soon the cost of sequencing the As, Ts, Gs, and Cs of individual DNA molecules will drop to a thousandth of what it has been, thereby transposing our studies of behavioral differences to the much more revealing molecular level. DNA messages extracted from, say, many hundreds of psychopaths can then be compared to equivalent numbers of DNA messages from individuals prevented by their consciences from habitually lying, stealing, or killing. Specific DNA sequences consistently occurring only in psychopaths will allow us to pinpoint the genes likely malfunctioning to produce psychopathy. The thought that some people might be born to grow up wicked is inherently upsetting. But if we find such behavior to be innate, the integrity of science, no less than that of ethics, demands that we let the truth be known. The relative extents to which genetic factors determine human intellectual abilities will also soon become much better known. At the etiological heart of much of schizophrenia and autism are learning defects resulting from the failure of key brain cells to link up properly to each other. As we find the human genes whose malfunctioning gives rise to such devastating developmental failures, we may well discover that sequence differences within many of them also lead to much of the observable variation in human IQs. A priori, there is no firm reason to anticipate that the intellectual capacities of peoples geographically separated in their evolution should prove to have evolved identically. Our desire to reserve equal powers of reason as some universal heritage of humanity will not be enough to make it so. Rather than face up to facts that will likely change the way we look at ourselves, many persons of good will may see only harm in our looking too closely at individual genetic essences. So I was not surprised when Derek, who had spent most of our meeting listening, asked apprehensively how many years would pass before the key genes affecting differences in human intelligence would be found. My back-of-the-envelope answer of “15 years” meant that Summers’ then undetermined successor would not necessarily need to handle this very hot potato. Upon returning to the Yard, however, I wondered if even 10 years would pass. Utilizing loan-level data, we analyze the quality of subprime loans by adjusting their performance for differences in borrower characteristics, loan characteristics, and economic circumstances. We find that during the explosive growth of the subprime market in 2001-2006 the quality of loans monotonically deteriorated and underwriting criteria loosened. In this respect, the rise and fall of the subprime market resembles a classic lending boom-bust scenario, in which unsustainable growth leads to the collapse of the market. We show that the problems in the subprime market were imminent long before the crisis in 2007, securitizers were to some extent aware of it, but a high house price appreciation in 2003-2005 masked the true riskiness of subprime mortgages. Bad news for holders of mortgage-backed securities! It looks like an average 15% (nominal -- larger in real dollars) price decline is required before price to rent ratios are back to historical ranges. Actually, that guesstimate assumes a 5 year "orderly" adjustment. The real figure of merit is that rent to price is down to 3.5% from a historical range of 5 to 5.5% How would you like to own an overvalued asset that returns only 3.5% (leaving you on the hook for property tax, maintenance, insurance, etc.)? Abstract: We construct a quarterly time series of the rent-price ratio for the aggregate stock of owner-occupied housing in the United States, starting in 1960, by merging micro data from the last five Decennial Censuses of Housing surveys with price indexes for house prices and rents. We show that the rent-price ratio ranged between 5 and 5-1/2 percent between 1960 and 1995, but rapidly declined after 1995. 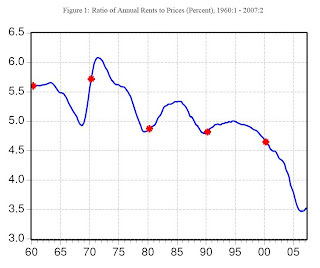 By year-end 2006, the rent-price ratio reached an historic low of 3-1/2 percent. For the rent-price ratio to return to its historical average over, say, the next five years, house prices likely would have to fall considerably.